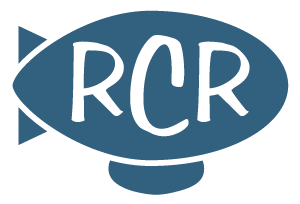 Document Records is a Scottish label known for its reverently compiled reissues of blues, gospel, bluegrass and other forms of American roots music… in other words, the last place I expected to find a new recording with a strong Akron connection. 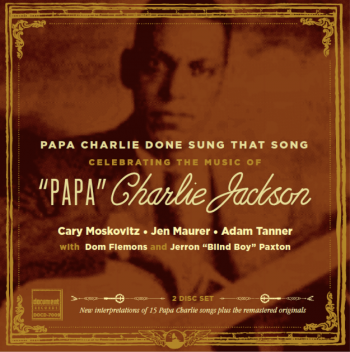 Papa Charlie Done Sung That Song: Celebrating the Music of “Papa” Charlie Jackson is a unique, two-part project. 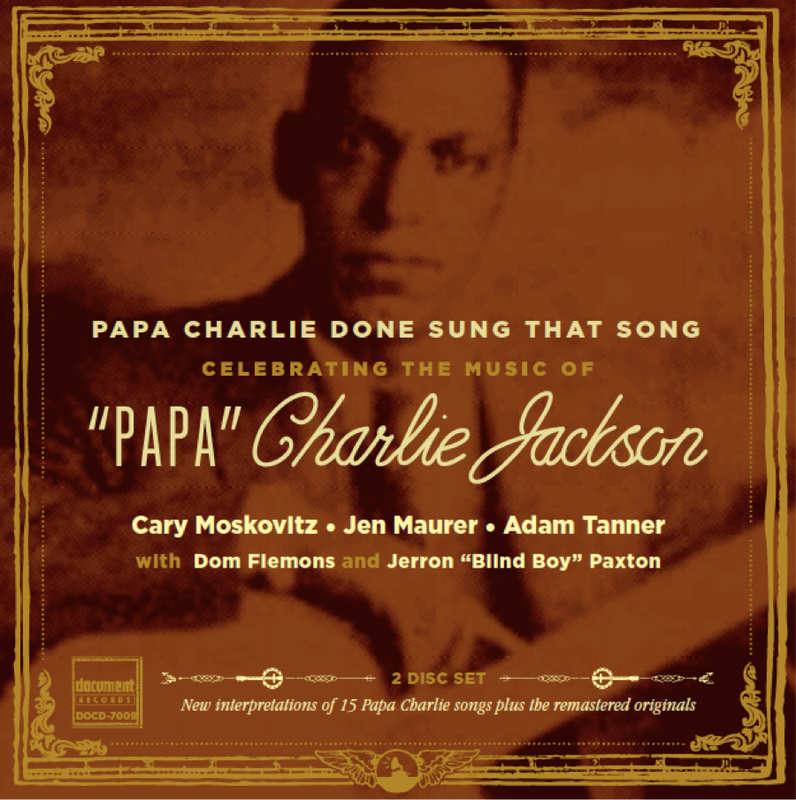 On disc one, a few of Papa Charlie’s modern-day followers – including the Rubber City’s Jen Maurer on vocals and bass and her husband Sam Rettman on harp – lovingly recreate 15 songs that Jackson first recorded in the 1920s. Alabama Bound, All I Want is a Spoonful, Shake That Thing, Fooling Around With You… Even if you haven’t heard the originals, you’re probably familiar with reinterpretations by more high-profile artists ranging from Howlin’ Wolf to Pete Seeger. 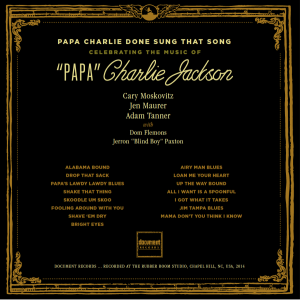 On disc two, the label gives those originals the full remastering treatment – leaving just enough noise to remind you that Paramount didn’t exactly spring for the best equipment to record Papa Charlie back in the day. 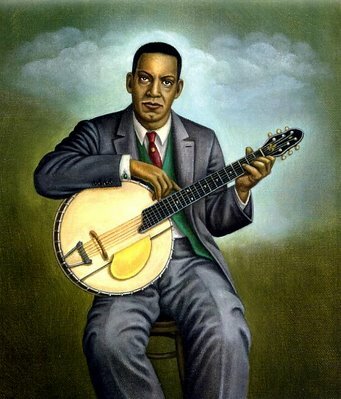 Born in New Orleans in 1887, Papa Charlie drew from the city’s rich musical gumbo and the vaudeville tradition that thrived during the turn of the century. I’m guessing his many trips to Chicago – and a fair amount of busking on the city’s legendary Maxwell Street – helped bring some blues-based authority to all that shtick. Jackson cut his first sides for Paramount in 1924 – songs that reveal a fully formed artist with great confidence in his material and his stagecraft. He recorded nearly 100 more before vanishing in the mid-Thirties (a fellow musician claimed he committed suicide in the late-Thirties by jumping into the Chicago River). His classic originals and adopted repertoire paint a vivid picture of post-WWI America – or at least the culture that thrived outside of high society. Here’s a little slice of the down-home life from a Papa Charlie original: “Some folks say chitlins are good to eat, but I’ll never eat chitlins ‘long as hogs got feet.” Probably not something you’d hear on my straight-laced grandma’s Victrola. Recorded at the Rubber Room studio in Chapel Hill, NC, the present-day half of the Document project was spearheaded by Jackson admirer Cary Moskovitz, a multi-instrumentalist (mostly guitar) and singer in the country blues vein who also can be found teaching “The Practice in Writing” as an associate professor at Duke University (I’m hoping he’s on board with RCR’s attempts to introduce the word “blowhardery” into the modern lexicon). Moskovitz recruited other like-minded musicians – including Maurer, Rettman, fiddler Adam Tanner, banjoist Dom Flemons, and Jerron “Blind Boy” Paxton on piano, guitar and vocals – and then launched a Kickstarter campaign to fund the project. Thankfully, Document Records boss Gary Atkinson came to the rescue by agreeing to release the new recordings (a rare contemporary offering from the label) along with the second disc of 15 reissued Paramount originals. I’ll express a little hometown pride by pointing out that Maurer is in fine form throughout. It’s a long walk from her usual gig playing zydeco with her band Mo’ Mojo, but she sounds like she was born to sing these songs (lots of audio samples in the video below). Paxton also brings some heat with his barrelhouse piano. 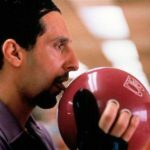 Thanks Alan. Didn’t know much at all about PCJ until Cary sent me the disc. These little discoveries make this lonely pursuit of mine very rewarding! It’s amazing that Carey managed to obtain the initial funds via a Kick Starter. 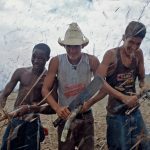 Who would have believed there would be so many PCJ fans keen enough to help?